An exception (or exceptional event) is a problem that arises during the execution of a program. When an Exception occurs the normal flow of the program is disrupted and the program/Application terminates abnormally, which is not recommended, therefore, these exceptions are to be handled. An exception can occur for many different reasons. Following are some scenarios where an exception occurs. A user has entered an invalid data. Based on these, we have three categories of Exceptions. 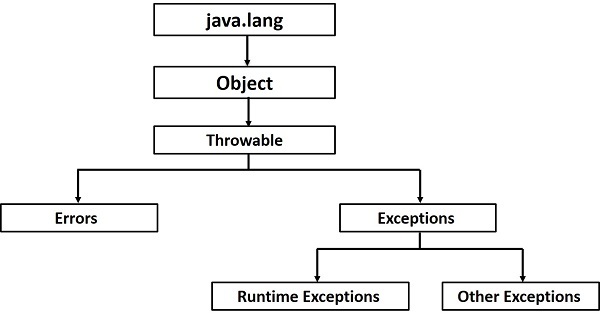 You need to understand them to know how exception handling works in Java. Checked exceptions − A checked exception is an exception that is checked (notified) by the compiler at compilation-time, these are also called as compile time exceptions. These exceptions cannot simply be ignored, the programmer should take care of (handle) these exceptions. For example, if you use FileReader class in your program to read data from a file, if the file specified in its constructor doesn't exist, then a FileNotFoundException occurs, and the compiler prompts the programmer to handle the exception. If you try to compile the above program, you will get the following exceptions. Note − Since the methods read() and close() of FileReader class throws IOException, you can observe that the compiler notifies to handle IOException, along with FileNotFoundException. Unchecked exceptions − An unchecked exception is an exception that occurs at the time of execution. These are also called as Runtime Exceptions. These include programming bugs, such as logic errors or improper use of an API. Runtime exceptions are ignored at the time of compilation. For example, if you have declared an array of size 5 in your program, and trying to call the 6th element of the array then an ArrayIndexOutOfBoundsExceptionexception occurs. If you compile and execute the above program, you will get the following exception. Errors − These are not exceptions at all, but problems that arise beyond the control of the user or the programmer. Errors are typically ignored in your code because you can rarely do anything about an error. For example, if a stack overflow occurs, an error will arise. They are also ignored at the time of compilation. Errors are abnormal conditions that happen in case of severe failures, these are not handled by the Java programs. Errors are generated to indicate errors generated by the runtime environment. Example: JVM is out of memory. Normally, programs cannot recover from errors. Following is a list of most common checked and unchecked Java's Built-in Exceptions. Returns the name of the class concatenated with the result of getMessage(). The code which is prone to exceptions is placed in the try block. When an exception occurs, that exception occurred is handled by catch block associated with it. Every try block should be immediately followed either by a catch block or finally block. The following is an array declared with 2 elements. Then the code tries to access the 3rd element of the array which throws an exception. You can throw an exception, either a newly instantiated one or an exception that you just caught, by using the throw keyword. Try to understand the difference between throws and throw keywords, throws is used to postpone the handling of a checked exception and throw is used to invoke an exception explicitly. The finally block follows a try block or a catch block. A finally block of code always executes, irrespective of occurrence of an Exception. // The finally block always executes. Generally, when we use any resources like streams, connections, etc. we have to close them explicitly using finally block. In the following program, we are reading data from a file using FileReader and we are closing it using finally block. try-with-resources, also referred as automatic resource management, is a new exception handling mechanism that was introduced in Java 7, which automatically closes the resources used within the try catch block. To use this statement, you simply need to declare the required resources within the parenthesis, and the created resource will be closed automatically at the end of the block. Following is the syntax of try-with-resources statement. Following is the program that reads the data in a file using try-with-resources statement. Following points are to be kept in mind while working with try-with-resources statement. To use a class with try-with-resources statement it should implement AutoCloseable interface and the close()method of it gets invoked automatically at runtime. You can declare more than one class in try-with-resources statement. While you declare multiple classes in the try block of try-with-resources statement these classes are closed in reverse order. Except the declaration of resources within the parenthesis everything is the same as normal try/catch block of a try block. The resource declared in try gets instantiated just before the start of the try-block. The resource declared at the try block is implicitly declared as final. You just need to extend the predefined Exceptionclass to create your own Exception. These are considered to be checked exceptions. The following InsufficientFundsException class is a user-defined exception that extends the Exception class, making it a checked exception. An exception class is like any other class, containing useful fields and methods. In Java, it is possible to define two catergories of Exceptions and Errors. JVM Exceptions − These are exceptions/errors that are exclusively or logically thrown by the JVM. Examples: NullPointerException, ArrayIndexOutOfBoundsException, ClassCastException. Programmatic Exceptions − These exceptions are thrown explicitly by the application or the API programmers. Examples: IllegalArgumentException, IllegalStateException.